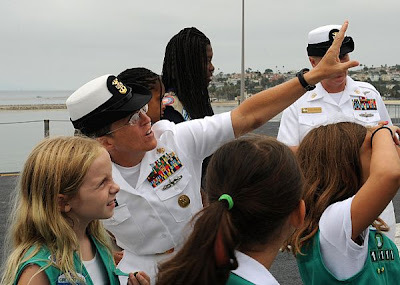 Navy.mil reports that on July 28, 2011, Command Master Chief Susan Whitman, assigned to the aircraft carrier USS Abraham Lincoln, spoke with Girl Scout Troop 1111 about the ship's aircrafts during a tour. Abraham Lincoln was participating in Los Angeles Navy Week 2011. Navy Weeks are intended to show the investment Americans have made in their Navy and increase awareness in cities that do not have a significant Navy presence.